I hate letting things go to waste – especially when it comes to time, money, and food. Hopefully, most of you share that same belief. After all, being wasteful is not a quality most gentlemen strive to achieve. Fortunately my wife appreciates my frugalness with money and time. And the food part? Well, let’s just say that she feels I take things to the extreme. You see, in my kitchen, my freezer is filled with bones, scraps, stems, sticks, rinds, and other mysteries known only to yours truly. Over the past few years, we’ve spent a lot of time here on AoM teaching you the fundamentals when it comes to cooking. From knife skills, to cast-iron cooking, to perfectly roasting a chicken – these are all skills a man needs to have in his culinary tackle box. So as I was casually perusing the grocery aisles the other day, I uncovered a culinary crime that I had to share with all you loyal readers. Since it’s the holidays, folks were stocking up on all the essentials: turkeys, rib roasts, stuffing, vegetables, pie crusts, and especially cooking stock. After all, a bit of stock or broth is called for in almost every holiday recipe. Four cups of store-bought stock costs over $5 bucks in most places. Gentlemen, it shouldn’t be so. Perhaps I’m partly to blame, as I’ve never detailed how easy it is to create your own stocks at home. And there’s no better time to learn than now. Christmas’ turkey carcass or leftover standing rib roast can turn into a luscious turkey or beef stock. The pork shoulder cooked on New Year’s Day can create a delicious stock for other soups and stews (and even chili!). Of course, all of that cold weather and hectic holiday travel calls for a comforting bowl of homemade chicken soup. Better yet, you don’t have to use it all right now – as these stocks keep well frozen for months in your freezer. Just pop ‘em out and thaw when needed. 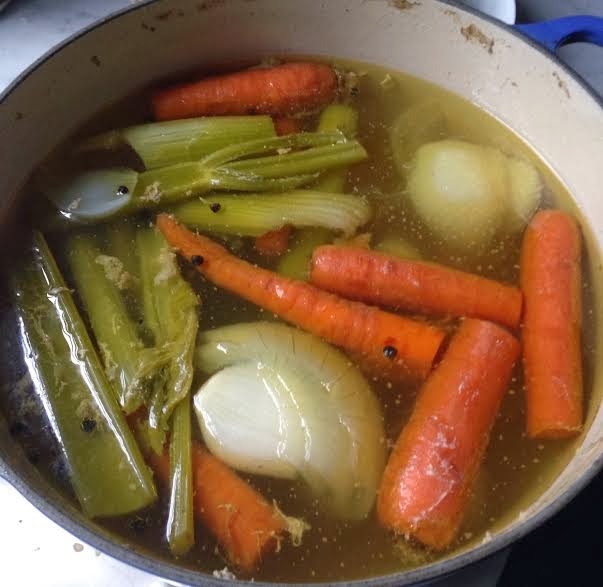 In this post, I’ll lay out how to make stock from four types of meat, and then give you a recipe with which to use that stock. Win-win! So this year, I encourage you to keep ‘stock-ing’ through the holidays. Spend a bit of time to save what you typically discard and enjoy good eats and cost savings in the New Year! I like to pick up whole chickens when on sale at the market, often purchasing them for less than $1 per pound. Though most folks use the bones or carcasses when creating their stocks, I often just slowly braise the whole bird. I remove the cooked chicken for use in soups or stews, or turn it into a quick chicken salad for use throughout the week. 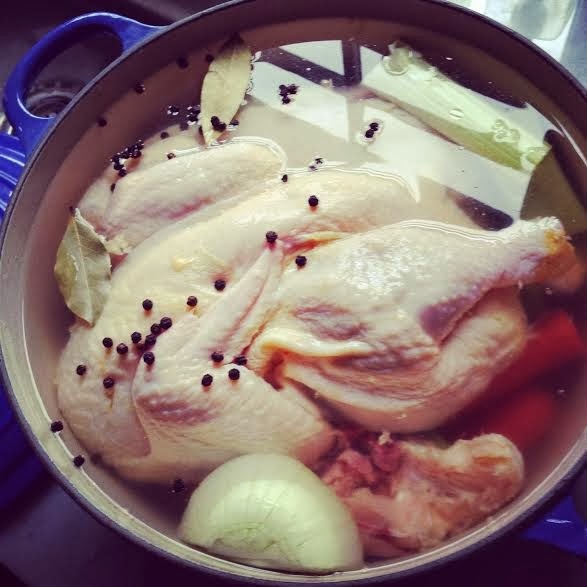 Either way, this is a simple, foolproof way to perform double duty – cook a chicken while creating stock. Add all ingredients into a stockpot and bring to a slow boil over medium-high heat. Reduce heat to low and simmer uncovered for 2 hours, skimming off any scum that rises to the surface. Strain ingredients, discarding the vegetables and setting chicken aside. Allow the stock to completely cool and chill overnight in the fridge. Skim the fat off the surface, discard, and use stock immediately or freeze for later use. Lately I’ve been stealing a page out of your Greek grandmother’s cookbook with this lemony chicken and orzo soup. Though this dish is typically prepared without meat, you can throw in the reserved chicken if you want a heartier version. The key to making this dish silky smooth and perfect is tempering the egg appropriately. You want to slowly add the hot stock to the egg mixture, whisking constantly to create a smooth texture. Do it too fast, and your eggs will scramble – which won’t affect the flavor or ruin the dish – but your grandmother would be disappointed. Bring stock to a slow boil over medium-high heat in a Dutch oven. Add orzo pasta and cook for 5 minutes, remove from heat. In a separate bowl, whisk together eggs, lemon juice, and nutmeg. While constantly stirring, slowly stream in about 3 cups of broth into the egg mixture – tempering the eggs slowly to bring them up to the same temperature as the stock. Add mixture into the Dutch oven and serve soup immediately. Over Thanksgiving, my dad proudly smoked the family turkey on his beloved Big Green Egg. Needless to say, that bird was delicious, and I didn’t want that flavor to end. So, I threw the carcass into a pot and created a rich turkey stock. 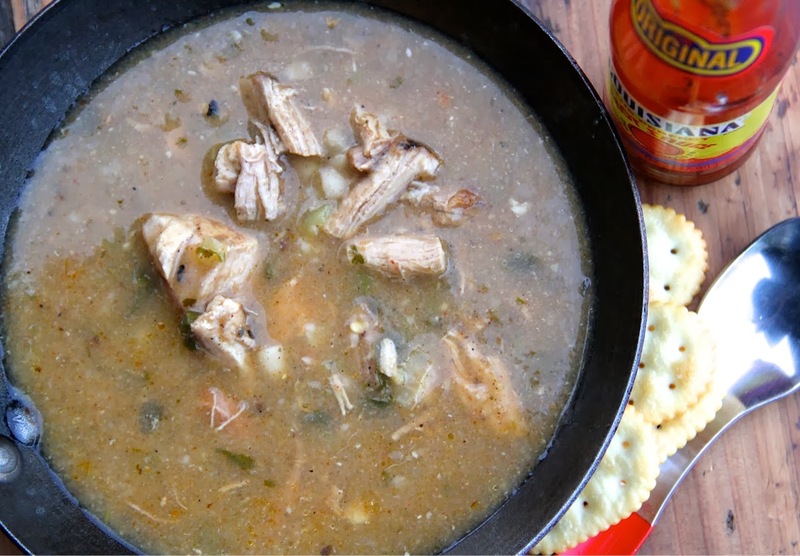 The next day, I made a big ole pot of turkey and sausage gumbo (below) – feeding the family again on the cheap. Simple, easy, and delicious. Add all ingredients into a stockpot and bring to a slow boil over medium-high heat. Reduce heat to low and simmer, uncovered for 2 hours, skimming off any scum that rises to the surface. Strain ingredients, discarding the vegetables and carcass. Allow the stock to completely cool and chill overnight in the fridge. Skim the fat off the surface, discard, and use stock immediately or freeze for later use. Turkey leftovers get jazzed up in this hearty, Creole favorite. They key to making a great gumbo is all about the roux. Spend the time to slowly cook the roux as dark as you can stand it – without burning. That extra effort will yield rich, caramelized flavors that are sure to please the entire family – even if you are trying to kick out the in-laws! Preheat a Dutch oven over medium-high heat; add sausage and brown for 5-6 minutes. Using a slotted spoon, remove sausage to a plate; add okra and cook for another 6 minutes, or until slightly charred. Remove okra and combine oil and flour in the pot, reducing heat to low. Whisk oil and flour until combined, whisking constantly, until dark brown and caramel in color, 40-50 minutes. Add onions and peppers and sauté until tender, 10 minutes. Next add garlic, and sauté until just fragrant. Deglaze by adding tomatoes, followed by one cup of stock at a time, stirring to ensure everything is evenly incorporated. Bring mixture to a slow boil, adding sausage and okra back into the pot and simmering until tender, about 15 minutes. When okra is tender, add reserved turkey meat and heat through. Serve with hot cooked rice. Standing rib roast is a Christmas Day special, one which we’ve perfectly outlined before. The problem is that most folks tend to throw away that roasted rib bone – what a waste! This year, turn that leftover bone into a delicious stock for my hearty, beef + vegetable soup. Add rib bone into a preheated stockpot over medium heat. Sear the bone on all sides for a few minutes. Add wine, scraping up any of the browned bits from the bottom of the pan using a wooden spoon. Next, add remaining ingredients into pot and bring to a slow boil over medium-high heat. Reduce heat to low and simmer, uncovered for 3 hours, skimming off any scum that rises to the surface. Strain ingredients, discarding the vegetables and rib bone. Allow the stock to completely cool and chill overnight in the fridge. Skim the fat on the surface, discard, and use stock immediately or freeze for later use. This dish screams comfort cooking, not to mention the fact that it can cure any holiday hangover. I like to toss whatever fresh vegetables I have on hand into this dish – making it super filling and quite healthy too. Go easy on the carbs by omitting the potatoes. Preheat a Dutch oven over medium-high heat; add oil. Brown the meat, working in batches if necessary, for a few minutes on all sides. Next, add onions, carrots, and celery and sauté until tender, 10 minutes. Add garlic, followed by the tomatoes to deglaze the pot, scraping up any of the browned bits in the pan using a wooden spoon. Add stock, followed by the remaining vegetables and simmer until potatoes are tender, about 10 minutes. Taste and adjust seasoning if necessary. It’s been rumored that pork is served on New Year’s Day to provide good fortune and abundance throughout the year. Truth be told, I eat pork as much as possible, often in smoked BBQ or bacon form! That being said, when its cold outside, I don’t always feel like breaking out the smoker, so I like to brown and slowly braise my pork shoulder in a Dutch oven. The meat turns out moist, perfectly stringy, and delicious when served piled atop cooked greens, rice, and black-eyed peas (a la New Year’s Day), or in my pork green chili (below). You can also use this broth as a base for making homemade pho – which seems to be all the rage these days. Add pork shoulder into a pre-heated stockpot over medium heat. Sear the shoulder on all sides, except the fat cap, for 5-6 minutes. Add wine, scraping up any of the browned bits from the bottom of the pan using a wooden spoon. Next, add remaining ingredients into a stockpot and bring to a slow boil over medium-high heat. Reduce heat to low and simmer, uncovered for 4 hours, skimming off any scum that rises to the surface. Strain ingredients, discarding the vegetables and bone while reserving the pork meat for later use. Allow the stock to completely cool and chill overnight in the fridge. Skim the fat on the surface, discard, and use stock immediately or freeze for later use. I often get tired of tomato, beef, and bean-based chili, so I take a nod from one of Colorado’s most prideful, and fiercely debated dishes in the following recipe. Green or red chili, whatever side you stand on, I really don’t care; they are both delicious. This version is a bit sour and salty with the flavors of fresh lime and spice – a good bit of heat is also playing behind the scenes as well. Trust me, it’s a great dish and a nice change of pace when entertaining guests throughout the end of this year’s football season. Preheat oven to 425 degrees F. Arrange the tomatillos, onions, jalapenos, and poblano peppers onto a baking sheet, ensuring poblanos are skin side up, and roast uncovered until browned and charred, about 45 minutes. Meanwhile, add stock, lime juice, and seasonings into a Dutch oven and warm over medium heat. Remove roasted vegetables from the oven and throw everything into the pot, except for the poblanos. Allow the poblanos to cool, remove the outer skin, and finely chop. Meanwhile, use an immersion blender to puree the roasted vegetables into the stock until rich and smooth. Add the chopped poblanos and pork meat into the pot and bring to a slow boil. Make a slurry with the flour and 1/4 cup water, pour into the pot (bring back to boil if needed), and reduce heat to low. Garnish with fresh cilantro, if desired, just prior to serving.